If you read my last post, I’ve been officially dairy-free since December 28th. Once you get past the first few weeks and build your pantry, it’s really not so tough. Jonny’s skin has never looked better! Living with a toddler, you’ll find that no meal is complete without noodles, rice, or bread, haha. I try to limit these things in my day to day diet, but we inevitably end up having these things a few times per week. And one can only eat spaghetti so much! I found this recipe on the back of a Manischewitz Egg Noodle bag — and I veganized it! It was super tasty, beautiful in color, and full of veggie goodness. I hope you like it as much as we did. The original recipe called for pine nuts, as do traditional pesto recipes, but I’ve subbed raw cashews in the past and liked the flavor (which is really no flavor). Do as you wish! In a food processor, combine all of the pesto ingredients and puree until smooth. Easy peasy! Cook the noodles as directed on the package. 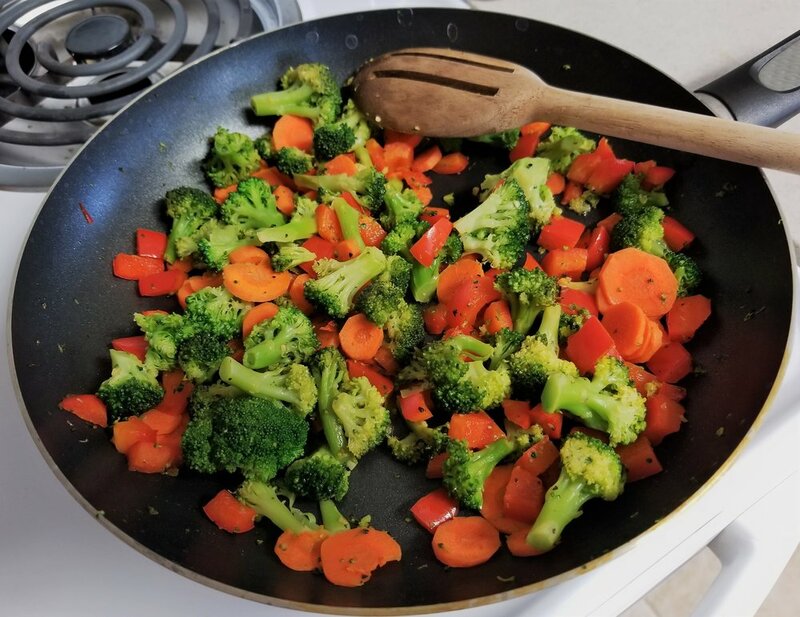 In a skillet over medium heat, cook your veggies in a tablespoon of oil. Saute the veggies until they reach your desired tenderness. When done, combine with your pesto and sprinkle with additional nooch.